The Rye Whiskey you need to try this year. Prohibition was certainly no easy time for any distilling company but none more so than Kentucky Peerless. Before Prohibition started they were making around 10,000 barrels a year of Whiskey and their investments into the local area had put them on track to become one of Kentucky’s biggest distilleries. By 1917, every drop was out of their barrels and the company ceased production until 2015. Since re-opening, Peerless has stayed true to its roots. Ancestors of the founder Henry Kraver are fully involved in reviving the business and they are determined to stay true to a handcrafted style of creating premium Whiskeys. From grinding grain to aging, everything is done in-house at Peerless, ensuring that the quality the distillery prides itself on will not be lost. Despite only re-starting production in 2015, we are now fortunate enough to have access to the first 24-month aged Rye Whisky from the distillery. We say fortunate because this Rye Whiskey has already shot to the top 20 Whiskies in the world list according to Whisky Advocate. At number 15 it is the only Whiskey in the top 20 to be produced by a craft distillery, and understandably, it’s quite a challenge to get your hands on. If you do, you’re in for a real unique Rye Whiskey that sets itself apart by using a purely sweet mash during production. This results in a non-chill filtered 53.8% ABV Rye Whiskey that is unusually smooth and complex for its age. This truly is a must-try for Whiskey fans as it brings a completely new set of flavors and style to the spirit. If you’re looking for the perfect Christmas Whiskey gift, this might be it. 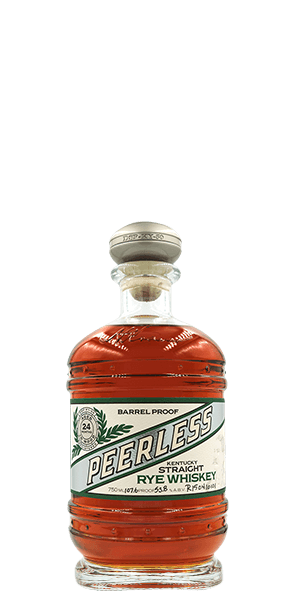 What does Peerless Kentucky Straight Rye Whiskey taste like? The Flavor Spiral™ shows the most common flavors that you'll taste in Peerless Kentucky Straight Rye Whiskey and gives you a chance to have a taste of it before actually tasting it. Pepper and grass with a hint of pumpkin pie. Cinnamon spice, candied corn and a touch of mint. Full bodied with a surprising smoothness for Rye Whiskey. Excellent. Have tried on one occasion. I'll have to try over a few separate occasions to compare to other Rye whiskies to compare taste with cost, but overall taste is very nice. Not sure it's worth the $120-130 premium cost, but I'll let you know. this was a gift to my doctor for the surgery he did on my. he's a great guy and volunteers his work from the university hospital to the VA . we are so grateful to have some one like him. he loves it by the way. Beautiful color. Nice spicy cinnamon flavor. Nice finish. Need to order another bottle. Absolutely my favorite rye, solid all around and the sweet mash can be so tough to pull off but works beautifully here.